Noam Chomsky, who was born in 1928 and began teaching at the Massachusetts Institute of Technology in 1955, has been described as the “father of modern linguistics,” but he is even better known as a political activist and public intellectual. A leading critic of U.S. involvement in Southeast Asia, the Middle East, and Latin America, he has also written critically about global capitalism and describes himself as a libertarian socialist. His many books include At War with Asia (1971); Fateful Triangle: The U. S., Israel and the Palestinians (1983); Manufacturing Consent: The Political Economy of the Mass Media (with Edward Herman, 1988); and On Anarchism (2013). In a corner of his office at MIT, Chomsky has a painting of Oscar Romero and the six Jesuits murdered in El Salvador in 1989. Nicholas Haggerty: I’m here to ask you about the subject of that painting. Noam Chomsky: I keep it there to remind myself of the real world. Also, it’s turned out to be an interesting kind of Rorschach test. I ask people often if they know what it is. Americans, almost nobody. Europeans, maybe 10 percent. Latin Americans, it used to be all of them, but younger people don’t know. NH: In a recent article, you mentioned the twenty-fifth anniversary of the massacre of those Jesuits. Why do you continue to think and write about this one particular incident? NC: For one thing, it’s pretty horrible, but for another it’s of enormous historic significance. That act culminated ten years of terrorist atrocities in Central America. The decade began with the murder of Archbishop Romero, it ended with the murder of the six Jesuit intellectuals. In between, two hundred thousand people were slaughtered. The United States was condemned for its involvement in some of these atrocities at the International Court of Justice, rejected it, and expanded the war. It was a really horrifying period. And that’s not all. It also culminated something longer. In 1962, President Kennedy changed the mission of the Latin American military from “hemispheric defense” to “internal security.”* Internal security means something. It means war against your own population. And that set off a hideous record of crimes and atrocities. In fact, Charles Maechling, who was the head of counterinsurgency and defense strategy under Kennedy and Lyndon Johnson, later said that this changed the United States from merely tolerating the rapacity of the Latin American military to directly supporting some of the methods used by Heinrich Himmler. Which is correct. And there’s more: 1962 was Vatican II. That’s when Pope John XXIII tried to return the church to the gospels, to what it was before Constantine made it the official religion of the Roman Empire. That was taken seriously by the Latin American bishops. They pursued the preferential option for the poor, they tried to get peasants to read the gospels, to organize them. That set off a war against the church. It was a brutal and bloody war. Religious martyrs all the way through, and plenty of others. Neo-Nazi-style national-security states in Brazil, Uruguay, Chile, Argentina. Finally they came to Central America in the 1980s. It was a hideous period. And it basically ended on November 16, 1989, with the murder of the six Jesuits in El Salvador. That is an event of very great historic significance. People in the United States ought to know about it. We’re responsible for it. It’s much worse than anything that happened in East Europe in that period. NH: You mentioned John XXIII moving the church back to the gospels. Do you see Pope Francis moving the church in a similar direction? NC: It’s kind of a work in progress. I think there are some indications, some steps in that direction. We’ll see. NH: You’ve often spoken reverently about the Latin American church. Yet, in Michael Gondry’s film Is the Man Who Is Tall Happy?, you mention harboring a deep fear of Catholics growing up in Philadelphia. Was there a person or event that changed that for you? NC: I began to change in the early 1960s, when I started getting to know people on the Catholic left like Dan Berrigan and Dorothy Day—really wonderful people. And then I went to Central America a couple of times. One of my closest friends was the rector of UCA—the Jesuit University in Nicaragua—César Jerez. He had a leading position in the church in Guatemala, but he was forced to flee when the Guatemalans announced that they were going to kill all the Jesuits. All the Jesuits were pulled out of the country, and he went to El Salvador. He was an educated person. Archbishop Romero was kind of a peasant—a very honest, decent person, but with little education. Jerez became his house intellectual. Remember the famous letter that the archbishop sent to President Carter, urging him not to provide support to the government junta? Jerez wrote it. Something extremely interesting happened then. I haven’t been able to write about it because there is no documentation. Jerez told me that he wrote the letter for Romero, and that the day the letter arrived in Washington, he got a call from the Vatican. Apparently, the Carter administration had asked the Vatican to call off this troublesome priest. They knew what he was doing. Jerez was asked to go to Rome right away. He went to Rome and met with the head of the Jesuit order, who asked him what he was doing. He told him, and got support to continue. He got an audience with the pope. Jerez said the pope was kind of noncommittal. He didn’t say stop and he didn’t say go on, so Jerez took that to be authorization to continue. He went back to San Salvador and a few days later Romero was murdered. Jerez then had to flee to Nicaragua. In fact, when I was visiting Nicaragua, I used to stay at the Jesuit house. It was quite a change. NH: You grew up reading the Hebrew Scriptures, and you’ve said Amos was your favorite prophet. Are you inspired by the prophets in issuing your warnings about the existential threats of nuclear and environmental disaster? NC: That’s too much self-glorification. What’s translated in English as “prophet” doesn’t mean prophet. It basically means intellectual. They were what we would call dissident intellectuals. Amos says, “I am not a prophet. I am not the son of a prophet. I’m a simple shepherd and farmer.” He was distancing himself from what we would call the intellectual elite, and speaking for the people very eloquently. Jeremiah, of course, was not treated nicely for his pleas for mercy and justice. But that’s typical. The people we call the prophets I think are the earliest dissident intellectuals, and they’re treated like most dissident intellectuals—very badly. They’re imprisoned, driven into the desert. King Ahab, the epitome of evil in the Bible, condemned Elijah as a “hater of Israel.” This is the first self-hating Jew, the origin of the term. It goes right up to the present. That’s the history of intellectuals. Most of them are false prophets, flatterers of the court. The real prophets are the exception and treated badly. How badly they’re treated depends on the society. Like in Eastern Europe, they were treated very badly. In Latin America, they were slaughtered. NH: You’ve mentioned in interviews that a spiritual transformation will have to occur in order for a libertarian socialist project to succeed, and that this project will itself bring about a spiritual transformation in society. NC: There has to be spiritual transformation among the masses, who have to be willing to recognize that their oppression is not a law of nature. That’s what Latin American bishops were doing when they formed base communities. They were trying to get peasants to recognize that you can take your fate into your own hands. That’s what the civil-rights movement did here. That’s what the women’s movement did. The women’s movement began with small consciousness-raising groups, where women talked to each other and said, “We don’t have to accept this kind of oppression.” It’s very dramatic in the United States. There are real, serious problems here, which we saw this past midterm election. It’s a striking phenomenon in American history. It goes way back. This has always been the richest and most secure, and sometimes the most dangerous country in the world. In the early years, the danger was to everybody near us, slaves, Native Americans, Mexicans. It finally expanded in 1898 to the Caribbean, Cuba, Puerto Rico, Hawaii, and the Philippines. Actually, the phrase “national security” is barely used until the 1930s. And there’s a reason. By then, the United States was beginning to become global. Before that the United States had been mostly a regional power—Britain was the biggest global power. After the Second World War, national security is everywhere, because we basically owned the world, so our security is threatened everywhere. Not just on our borders, but everywhere—so you have to have a thousand military bases around the world for “defense.” Meanwhile, we have the greatest security any country ever had. And along with that comes fear. The United States is one of the most frightened countries in the world. It goes way back to the colonies. Take a look at the Declaration of Independence. One of the charges against King George III is that he unleashed against us the “merciless Indian savages” whose way of warfare is destruction and terror. That was Thomas Jefferson! He was there, he knew it was the merciless English savages, but claimed was the merciless Indian savages who were attacking us. And then there was a fear of a slave rebellion. One of the reasons for the insane gun culture in the United States goes back to fear of Indians and slaves. When you’re crushing people, they might react, so you have to defend yourself. And it goes all the way through right to today. Take something like the Ebola outbreak. People are terrified. I think that’s a large part of what happened in the midterm elections. It’s just a very frightened country, and that makes it extremely easy to mobilize people for aggression and violence. All you do is tell them we’re threatened and they immediately huddle under the umbrella. NH: Related to the subject of fear in the United States, why did working-class Irish Catholics start voting Republican in the late 1960s and early 1970s? NC: Busing really changed things dramatically in Boston. In fact, there’s some scholarship on this, around the country. You can see why. Take a look at busing in Boston. It was organized by Harvard liberals, suburban, liberal progressives. It was designed to stop segregation. But how did they do it? They sent Irish kids from South Boston into Roxbury, black kids from Roxbury into South Boston—and nobody into the suburbs where the rich liberals lived. And of course it set off conflicts. An Irish guy who worked for the telephone company who finally had enough money to buy a small house and have his kid go to high school in a nice neighborhood, all of a sudden his kids were being sent into Roxbury and black kids were coming in. He’s furious. It was a big change for the country, and there were a lot of other things like that. That’s where Reagan Democrats come from. Their way of life was being attacked. Roe vs. Wade was part of it. Their way of life was being attacked by liberals, so they started hating liberals and voting against their own interests. That’s why you have working people voting to destroy themselves. It’s striking. It’s pretty much the same that’s happening in England. The policies of UKIP [the UK Independence Party] are very harmful to working people and yet that’s where their votes are, because people are so afraid of them coming and taking everything away from us. The fear in the United States is particularly dramatic among the Irish, who were treated horribly when they came here. In late nineteenth-century in Boston, you could find signs that said, “No Dogs or Irish.” Finally the Irish started working themselves into the mainstream and became influential, but in their background they were treated virtually like African Americans. Now they have shifted enough to be afraid of them. It’s an astonishingly racist country. Take a look at the voting, the red and blue states. It’s pretty much the Civil War. The Confederacy is all red. Why did they become Republican? Because of the civil-rights movement. So they switched from Democrat to Republican. NH: Is there a connection between this racism and the burgeoning nationalist movements in Europe? NC: It’s very frightening, and they’re spreading all over. France is awful. East Europe is the worst. Hungary is now run by a virtually neo-Nazi party [Jobbik]. You never really saw the racism in Europe in the past because it was so homogeneous. When everyone is blonde and blue-eyed, you don’t see racism. But as soon as there was the beginnings of immigration, it just came out very dramatically. A lot of people are fleeing Africa, which is a complete horror story—largely because of European actions over the centuries. So they’re fleeing to Europe. The first place they go is Italy. Italy has sort of been rescuing people, but they announced recently that they want to stop, they want to hand it over to the European Union. The EU pretty much announced that they’re not going to do much. England said they’re not going to do anything. So if hundreds of thousands of people die at sea, it’s their problem—fleeing from centuries of European aggression. We’re doing the same thing. The people who are fleeing Central America—what are they fleeing from? [Chomsky points at the painting of Oscar Romero] Things like that. Right around Boston there is a Mayan community. Today that woman over there [Chomsky points to a framed photo] happens to live with my daughter. She’s a Mayan refugee. They’re fleeing from the aftermath of the virtual genocide in the highlands in the early 1980s that the United States supported. And we pick them up at the border and throw them back. Just a couple days ago there was a Human Rights Watch report condemning the United States for throwing back refugees—women and children. It’s a real horror story. Most of the refugees are now coming from Honduras. In 2009, the military in Honduras threw out the president in a military coup. They ran an election—it was recognized by Obama but practically nobody else. Since then, Honduras has become a murder capital of the world; there’s horrible atrocities, infanticide, murder of women is way up, and people are fleeing in desperation. They come to the border, and we put them in trucks and send them back to Mexico to die. And here people are scared of illegal immigrants—that’s what we’re doing. It’s pretty shocking. NH: Whenever you’re interviewed, it seems as if you’re asked the same questions over and over again. Do you ever get tired of it? What keeps you going? NC: Looking at pictures like that [Chomsky points again at the Romero painting]. I wish I got asked about that more. I really do. This interview has been edited for length and clarity. It took place on November 7, 2014. 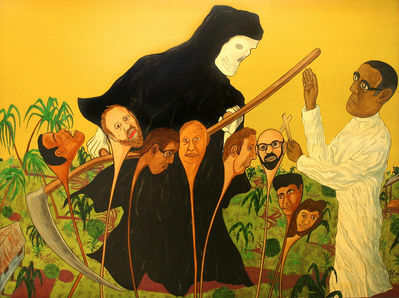 Image credit for "Bishop Romero and the Jesuit Martyrs," by Frank Escalet: Collection OAS Art Museum of the Americas, gift of Jose Lozano. Nicholas Haggerty is a former editorial intern at Commonweal.